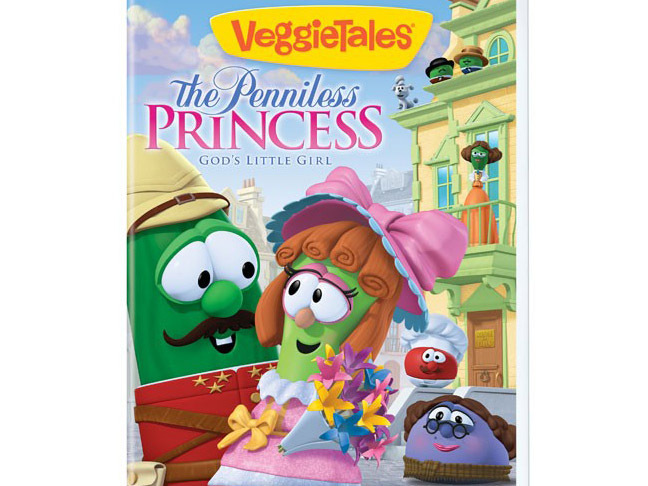 You won't want to miss The Penniless Princess: God's Little Girl, the newest film in the adored Veggie Tales series! A lighthearted treat with music and lots of laughs, this is entertainment with a valuable lesson for kids. The latest installment of Veggie Tales features the story of sweet Sara Crewe, a lucky little girl bestowed with a life of material wealth and all her heart's desires, but in a sudden drastic turn, she goes from riches to rags. Poor for the very first time, Sarah learns that real worth lies in the strength of her character. An inspiring tale that teaches children the value of inner beauty, this is a fun and hearwarming family film. Kids love the Silly Song, a giggle-worthy musical feast that has laughs for everyone, and moms love the heartfelt lessons with a spiritual twist. Want to get your hands on this charming disc to add to your family DVD collection? Check Christian retail stores on August 11th and all other DVD retail outlets on August 14th to pick up your copy.